Found 20 file extension associations related to LibreOffice Draw and 4 file formats developed specifically for use with LibreOffice Draw. 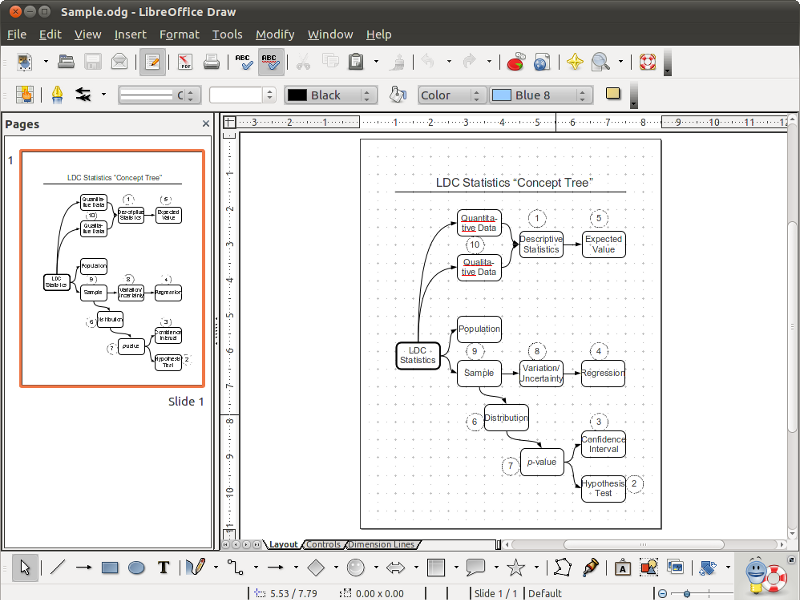 LibreOffice Draw lets you produce anything from a quick sketch to a complex plan, and gives you the means to communicate with graphics and diagrams. With a maximum page size of 300cm by 300cm, Draw is a an excellent package for producing technical drawings, general posters, and much else. You can arrange your most-commonly used drawing tools around your screen, ready for single-click access, and take advantage of the "Styles and Formatting" box to put all your graphics styles just one click away. You can manipulate objects, with the ability to rotate them in two or three dimensions. the "3D Controller" gives you access to spheres, rings, cubes and other objects. You can arrange objects, by grouping, ungrouping and regrouping them, and can edit objects while they are grouped. Sophisticated rendering let you create photo-realistic images with your own texture, lighting effects, transparency, perspective and more. Smart connectors make it easy for you to build flowcharts, organization charts, network diagrams and much more, even if you're not a naturally-talented artist. You can define your own "glue points" for connectors to adhere to, for precise and easily-repeatable positioning. You can use the picture gallery to access standardly-provided clip art, and can create your own art and add it to the gallery. You can save your graphics in OpenDocument format, the new international standard for documents. This XML-based format means that your files can be opened by recipients who are not LibreOffice users: your graphics will be accessible with any OpenDocument-compliant software. Draw can import graphics in all the commonly-used formats (including BMP, GIF, JPEG, PNG, TIFF, and WMF). Draw can also export your work to Flash (.swf) format. If you need more information please contact the developers of LibreOffice Draw (The Document Foundation), or check out their product website.